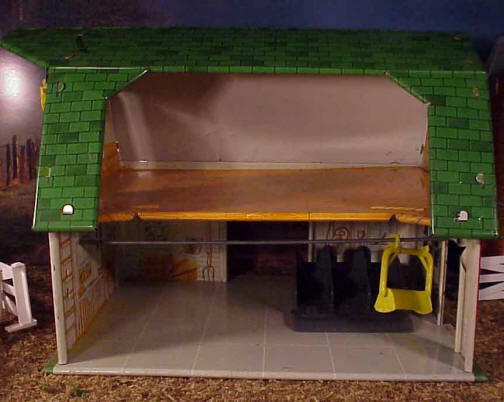 As the Marx playset era dawned in 1951, the earliest sets featured were the Marx Service Stations, the Western Ranch, the Truck Terminal, the Train Freight Station, the Army Training Center, and the Modern Farm. Over the years, playsets would come and go, but only the Marx farm was in continual production in one form or the other from the beginning to the very end of the Marx playset era. 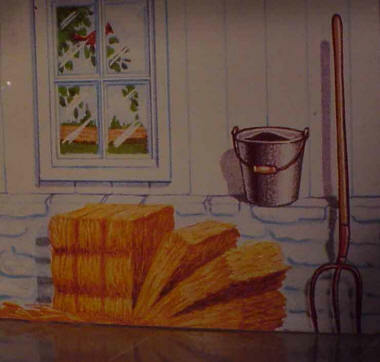 The Marx farm was present in both the 1951 Sear's Wishbook (1.) and the 1951 Montgomery Ward (2.) Christmas catalogs. These catalogs are important because today's collectors can look at these ads and usually get a pretty good idea of what components were included in these sets. It is interesting to note that even at this early time period, Marx was customizing his sets for different customers, because as shown in the catalog pictures, the Montgomery Ward version of the first Marx farm differed from the Sear's version. Many years ago, I bought a couple of the Marx farm sets and never looked at them after I brought them home. My interest in them was rekindled when Playset Magazine featured all the 1950s farm sets in their wonderful "Farm issue" (3). This issue allowed me to identify all the contents of my Marx Farm, and instilled in me a desire to obtain other farm sets. It is also my understanding that this issue created a tremendous renewed interest in the Marx farms. As a kid, I played with a lot of farm toys. It could be because my grandpa was a farmer. I never had any of the Marx farm toys. All my farm toys were large scale metal models that actually worked. Recently, I found all these toys in a large box in my parent's garage. They looked like they had seen hard play. After all, my brother and I played with them outside in the dirt! This month's featured set is the Marx Happitime Modern Farm Playset from the Sear's Christmas Wishbook of 1951 and 1952. It has no Marx playset number on the box. Another way of knowing what was in a Marx playset was by looking at the box. 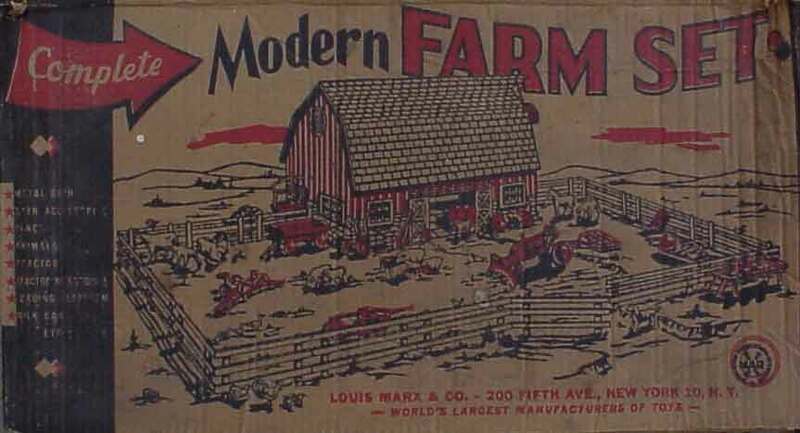 In the case of the Modern Farm, the box art is deceiving. The cover art to my farm sets does not show a silo, nor does it show all the farm tractor implements that the set contained. The black and red litho over the brown box is functional, but not impressive. The side panels are black and the Marx logo is hard to see. Of course, the barn is the focal point of the playset. 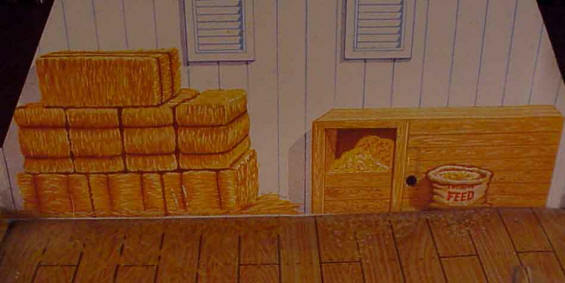 It comes in four pieces: roof, ground floor, hay loft floor, and front and side walls. The lithography is bright, cheerful, and highly detailed. There are several openings in the tin that represent doors and windows. The front door of the barn is opened wide and allows access to the inside. The front of the barn also has two windows that are just painted on and don't allow you to see the inside of the barn. However, on the inside view of the barn litho, these same windows reveal an idyllic and pastoral view of what should be outside the barn. There are beautiful, springtime trees with songbirds in them from one view, and an old time fence with another songbird on it from the other window. 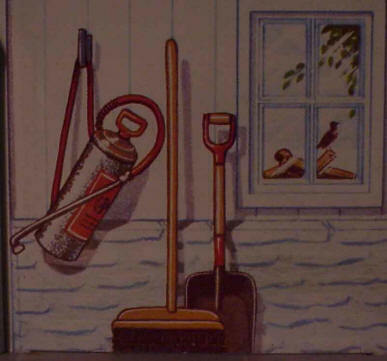 The inside of the front part of the barn also shows various farm tools hanging or leaning from the walls. The back of the barn is open to reveal the barn floor with its two slots for the cow stall and the wonderful barn loft, which is covered with hay and spilled feed. 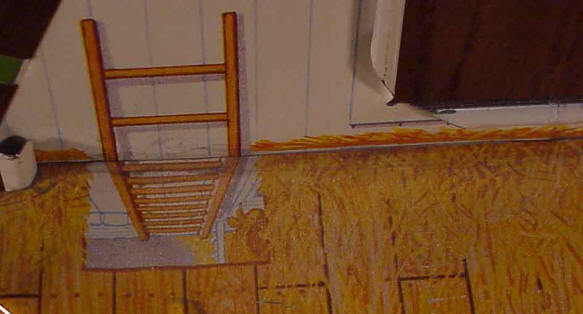 The floor of the barn loft also shows a ladder access hole with a ladder painted in it. This matches perfectly with the painted on ladder on the inside wall. It is amazing to me that Marx would include such detail for something that was relatively obscured when the barn roof was on. On the other hand, even with the roof on, little eyes can still peer through the gloom to see the interesting loft details.